I'm still working on figuring out what to do about Thanksgiving books. If you're not familiar with the Thanksgiving myth and the harm it does, I'd start with Debbie Reese's posts about Thanksgiving (linked to my favorite and there are more linked on the left side of her page). Reading While White has also thought about Thanksgiving and offered resources on updating your Thanksgiving displays. My library still has a large collection of books that perpetuate the Thanksgiving myth. When we looked into withdrawing them, we realized it would leave us with about 10 titles. And there's not a lot to replace them in the holiday section, particularly for young children. So, we're still working on figuring out what to do. 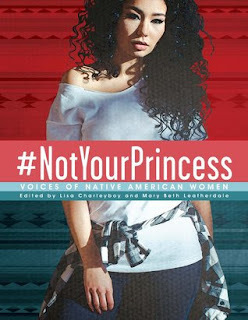 #NotYourPrincess: Voices of Native American Women edited by Lisa Charleyboy and Mary Beth Leatherdale is a powerful collection of writing and art. The collection includes poetry, essays, paintings, photography, and commentary from a wide range of Native American women. Topics run the gamut from identity to fashion to sexual abuse to sports. Essays address "the invisible Indian" from a young lady who doesn't "look Indian" and is made to feel out of place for that or the continuing pain felt by families who were forced into the residential Indian schools. A powerful poem "The Things We Taught Our Daughters" talks about allowing a cycle of violence against women to continue because "We don't call the police on our own." "They want buckskin and war paint, drumming, songs in languages they can't understand recorded for them, but with English subtitles of course. They want educated, well-spoken, but not too smart. Christian, well-behaved, never questioning. They want to learn the history of the people, but not the ones who are here now, waving signs in their faces, asking them for clean drinking water, asking them why their women are going missing, asking them why their land is being ruined." This book truly has the potential to change minds, but we've got to give it to our teens. Now. The format of the book is that large format nonfiction, which can be a hard sell with teens. But it's worth the effort of pressing it into their hands. Maybe sell it as a magazine-style book instead of what can appear to be a picture-book format. The colorful spreads and varied, interesting formats do resemble a magazine's content. Do what you need to do to get this book and put it into the hands of teen (and adult) readers. #NotYourPrincess: Voices of Native American Women edited by Lisa Charleyboy and Mary Beth Leatherdale. Grades 8+ and adult crossover. Annick Press, September 2017. 103 pages. Review copy provided by my local library.